We know that you have questions, we hope that this list will help, if you can’t find the answer here, please don’t hesitate to give us a call at 262-884-7100 so that we can answer all of your questions. We love dogs too. However, we do not allow dogs here at Apple Holler. Please keep in mind that there are often large crowds, and some dogs may not do well around a lot of people. Also, there are folks that aren’t fond of dogs. It’s recommended that you leave your pets at home for the comfort and safety of all guests (and pets!). Do not leave your pet in the car. Keeping in mind the safety and well-being of your pet, it’s best to leave him/her at home because we do not allow them here at Apple Holler. What is the Refund/Raincheck Policy? Admission refunds or rain checks are not given as a result of inclement weather. Some attractions may close until surfaces dry or risk of high winds or lightning has passed. You may get your hand stamped for re-entry the same day. Cider freezes beautifully – It will taste just as good or better when you bring it out to thaw! Stock up so you will have plenty for the holidays and the year ahead. Not all varieties are ripe at the same time. We carefully monitor the orchards and only open for picking the areas that have ripe fruit. Our staff will direct you to the current picking areas – please respect our property and stay in these areas. To see our other farm policies, please take a look at the our visitor guidelines page. When do apples (peaches, pears, etc) get ripe? Please see our picking calendar for general ripening dates. Remember that ripening dates can vary due to weather; please call Apple Holler at 262-884-7100 for current information. Yes, Our restaurant is open every day (except Christmas Day). Yes, we do, please check out our wedding page for more details. What should we wear to come picking? We are a working farm, and the ground can be uneven. Depending on the weather, it may be dusty, muddy, slick, etc. Proper footwear is important, close-toed shoes are recommended. Do I need to bring a basket or bags for our apples? No, we will provide your picking bag with your picking package. Can we bring a picnic to have in the orchard? We have a wonderful full-service restaurant for you to enjoy as well as our Applewood Outdoor Grill which sells items like hamburgers, hot dogs, brats, roasted corn and more. 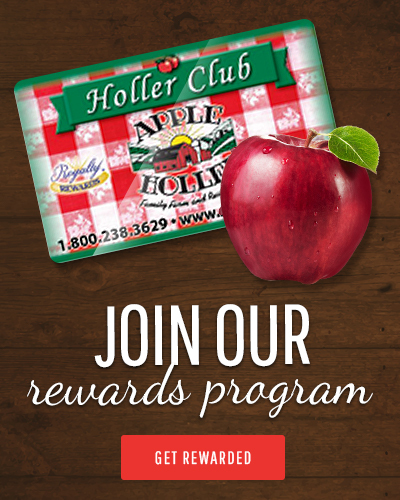 We ask that you do not bring outside food here to Apple Holler. Do you have Cider Donuts all year? We are thrilled to say that we do! Something so delicious can’t be limited just to a season! How should I store my fresh baked apple pie? Pies should be kept in the refrigerator, we do not use any preservatives in our pies, keeping the pie cold is best. Also, if you would like to keep your pie for another time, we suggest freezing it, they freeze and thaw beautifully. I purchased a Frozen Pie – How do I bake it? Thaw pie at room temperature for 1 hour. Beat 1 egg & brush lightly on crust. Sprinkle with 1-2 teaspoons of sugar. Poke 6-8 vent holes on top crust. Bake for about 1-1.25 hours at 350. To bake from frozen – Bake 1.5 hours or more. To check to see if your pie is ready, poke with a knife. It should slide in and out easily. How should a cook the Pot Pie I purchased? Large Pie: Bake from frozen for 1.75 hours at 350. Small Pie: Bake from frozen for about 1.25 hours at 350. What do you recommend that we do with the apples that we picked? There are so many GREAT recipes that use apples. We have a lot of apple recipes on our website. If you use one, please let us know how it turned out for you. How should I store my apples? It is best to keep apples cold in the refrigerator. That will keep much longer than if they were kept at room temperature. In September and October, we do charge for parking in our secure lots. However, there is free parking along the Frontage road at your own risk. Can I eat apples while I am picking? Sampling a piece of fruit that you’ve just picked is one of the joys of u-pick, and we are happy to include this as part of our guest’s experience. Can I bring my own wagon? Yes, that is a great idea. We do have wagons for rent, however, they are available on a first come first serve basis. Yes, we do! You can find our Picking Package information here.